Crafty with fiber and fabric? Me too! HK crochet Squares, originally uploaded by IamSusie. 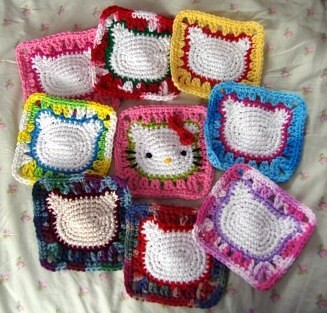 Last year I found a thread on Craftster about the Hello Kitty Granny Square. It is an elusive pattern, printed in a Japanese Crochet book. Because of copyright rules... if you want the pattern yourself, you very well might find an uploaded copy of it if you google "hello kitty granny square pattern". Be prepared... it's an international crochet chart, not a written pattern. 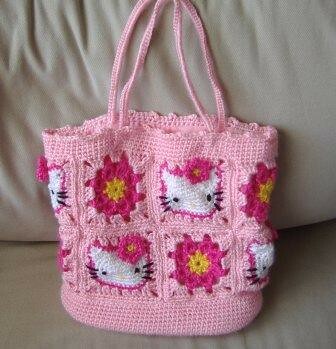 The cutest thing to make with the pattern is a tote bag. I made one for my niece last summer. It does have that handmade look... I was pleased with myself for achieving a lining for this tote too. Otherwise I just do the little square and pouches. I've seen adorable scarves made with it too, but that is still on my to do list. That one is in thread crochet. I've made 2 like this one, both for swaps. It is a perfect size for a doll like the popular Blythe dolls. People always want her in pink, but I like all the other color combinations too. EDITED TO ADD: I get queries all the time for me to send this pattern out. I don't really understand this because all you have to do is google it and the pattern comes up right under the link to this blog post. It's the link at Craftster. Page 4... scroll down.... And if you want me to explain how to stitch it, I would please ask you to read through that Craftster link first.. We have discussed at length the pitfalls of this more challenging little crochet square. You start in the center with 6 chains. SC in the 2nd chain from the hook and go around from there. Do the first ear, then you'll need to start a new yarn to do the second ear. Go around the face with a contrasting yarn using single crochet all around. I have to add a few stitches that arent in the pattern up at the top near the ears. Try to keep it symmetric. In case you were wondering, I am not going to write out English instructions for this square. Apart from the copyright violation, I prefer the chart. This is the pattern where I learned international crochet chart patterns and you can too! These are darling! I am going to give it a try! Anonymous Roswitha- You gave me a bad email address, so I have no way to contact you. Sorry. I did try writing you a detailed email. 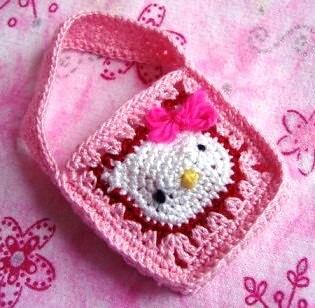 I don't know how you missed the pattern if you googled "hello kitty granny square pattern" In my search, it's the Craftster thread, "Anyone Know How to do the Hello Kitty Granny Square?" and the pattern is on page 4 of the thread. scroll down. Hi Susie, I found the patterns for the Hello Kitty part, but what about the flower on her head? Please reply soon. Thanks in advance! For the flower, I just make a tiny little crochet flower. Patterns for suitable wee flowers are fairly standard and easy to find. I just stitch it on. I also make a loopy bow by wrapping yarn around a few fingers and then wrapping it up, knotting tightly, and stitching on..
Could you just tell me the name of the Japanese book? I've subscribed to the comments of the thread so I'll get a notification if you reply. Hali- I don't know the name of the book. I don't own it and since it's in Japanese and I don't speak or read Japanese, I still wouldn't know it. I got the pattern for the square from the Craftster thread as explained above. The book has been out of print for awhile. I found the book on Ebay for $8.00 US. just now and purchased it. I can understand Japanese pretty well. I just went by the cover of the book in your post. I thought YOU took the photo and owned the book. You didn't. I get that now. Thanks though. The book is pretty easy to find on Ebay as it goes! Hali- I'm glad you found it! I have a PDF version that someone shared with me but I am reluctant to hand it out as I get tons of queries about this granny square from all over the world. There is a new book out with a Hello Kitty motif that is a little bit different than this square. That one is just the white head as a sort of applique. It's a fiddly little motif that seems to take longer than it should, but she's very fun to make! Hi, I've searched the web and cant't find the pattern... i think crafster just download it or something... i'm very interested...could you please share it with me? SUPER adorable! I found the pattern and can't wait to get my stash back to start working on some of these... I can't get over them, really. Here's hoping I can figure out the pattern, even with the English translations, haha. Hmm.. anonymous... Did you read any of the above post and comments? I say several times where and how to find the pattern online. I do not wish to be the clearing house for a pattern that is not my own. When you find the Craftster.org link, go to page 4 and scroll down and you will see the pattern chart. 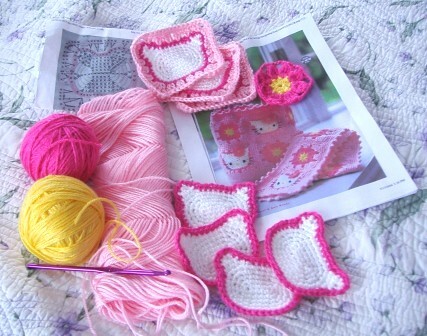 I will like to try my hand at this beautiful hello kitty granny square... yours are breathtaking !!! why the japanese chart leaves blank spaces without the symbols around the oval part ? I will greatly appreciate any help !!! I'm in the TTT4 ... Dona Leonor (The Fantastics group). I have never follow a chart before ... so my brain is smocking right now from trying to figure it out ...LOL ! I can barely follow simple written patterns ! Nice work! Your stitches are perfect! I think this is the cutest. I, too, would like to make it. I have 2 grand daughters, ages 4 & 5, that would love to have a bag with this on it. Would you please send me your pattern. My email is butterflynanax4@gmail.com. Thanx & happy crocheting!